Circle Fidelia, Thoburn’s King’s Daughters, pictured in about 1893. The group was tied to Trinity Methodist Episcopal Church. First row: Lula Bell, Lenore “Dot” Vail, Bessie VanRenslaer, Edna Francis. Second row: Bess Moore, leader Caddie Faurot, Bess Reichelderfer, Jessie Boone. Back row: Bonnie Meisse, Hattie Moore, Hattie McCoy, Ethel Rockhill, Grace Orchard, Inez Low. A booklet from 1952-‘53 from Lima’s Mercy Circle. It focused on philanthropic projects. The Ohio Voice was a monthly publication of the International Order of the Kings Daughters and Sons. A hymn for the group holds dear its ideals of helping others. LIMA — The United States had been involved in World War I for a year and its effects were being felt on the home front, including, the Lima Sunday News pointed out on April 28, 1918, the city’s social scene. War or not, the women of the Mercy Circle of King’s Daughters, a group frequently mentioned in the society news of local newspapers, had been doing “work of a real beneficial nature” before the war began and would continue to do so into the late 1970s. The Mercy Circle had as its motto, “Whatever thy hand findeth to do, do it with all thy might,” and, true to the motto, the group would find much work to do over the years, and much of that work would be of the hands-on variety. Although the Mercy Circle of King’s Daughters was formed in April 1916, the King’s Daughters had already been around for several decades. Founded by Margaret Bottome, of New York City, with a membership of 10 women, the non-denominational Christian group founded on the principle of service to others. An Ohio branch was organized in 1888 and soon thereafter Lima had its first group. Led by Caddie B. Faurot, the group had about a dozen members and began appearing in meeting notifications in local newspapers around 1890. 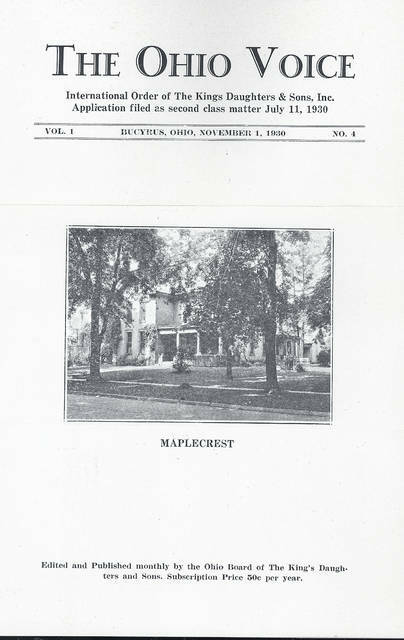 “The King’s Daughters of Market Street Presbyterian Church will give an entertainment Wednesday evening at the residence of Mrs. Agerter, 890 W. Market St. Ice cream and berries will be served for 15 cents. All are cordially invited,” read one such item from July 1890. 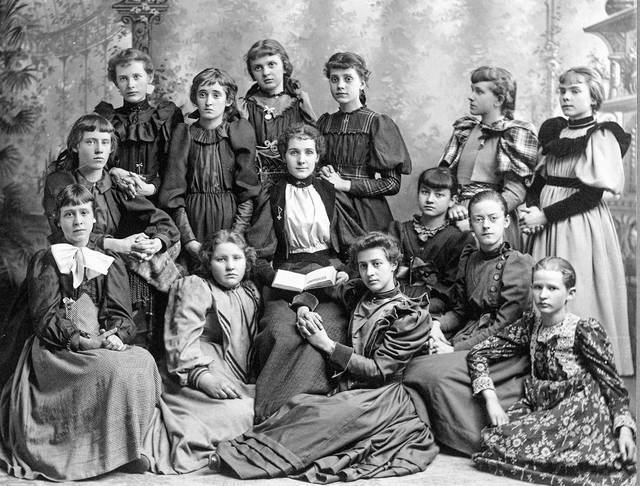 King’s Daughters groups soon organized in several Lima churches, notably at the German Reformed Church and the Trinity Methodist Episcopal Church, where they were known as Thoburn’s King’s Daughters. James Mills Thoburn and his sister, Isabella Thoburn, were Methodist missionaries to India who were born in Belmont County. 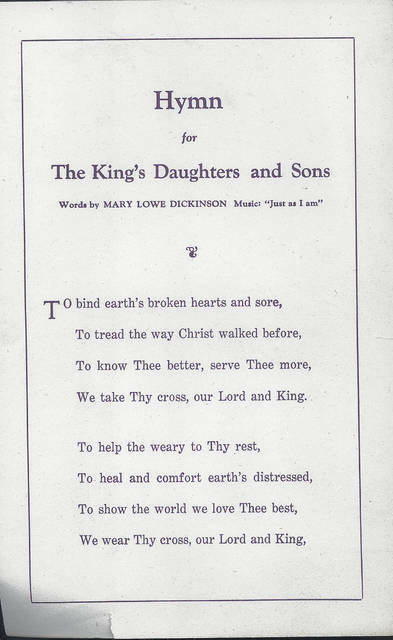 Much of the Thoburn group’s focus was on supporting mission work in India, specifically that of Ohio native Mary Reed “The King’s Daughters, aided by the WFMS (Women’s Foreign Mission Society), have sent a box to Miss Mary Reed, who, while doing missionary work in India, contracted the disease of leprosy and is now doing the same kind of work among the poor outcasts of India, afflicted as she is. The box contained many beautiful articles, such as go to make home cozy and comfortable,” the Lima Times-Democrat wrote on Oct. 5, 1894. Two and a half years later, Reed was still on the minds of the King’s Daughters, as evidenced by an article in the Times-Democrat from May 15, 1897. “The attractive home of Mrs. John Page on West Wayne Street was the scene last evening of a very pleasant gathering of the WFM Society and the Thoburn’s King’s Daughters,” the newspaper reported, adding, “Miss Humphrey recited with good effect a poem by Miss Mary Reed, the leper missionary.” Reed continued her mission work in India into the 1930s. She died in 1943. The King’s Daughters of the German Reformed Church also remained very active in Lima. “The King’s Daughters of the German Reformed Church celebrated the 25th anniversary of the organization of the society last night with a banquet at the parish home,” the Daily News wrote Oct. 15, 1915, noting the King’s Daughter’s society was “just half as old” as the church itself. The German Reformed Church group also did its part for the U.S. effort in World War I. “The Kings Daughters of the German Reformed Church will hold a Christmas sale at the home of Mrs. Alan Metheaney, of west North Street Wednesday and Thursday of this week. The proceeds will be donated to the Red Cross war fund,” the Daily News reported on Dec. 10, 1917. Besides making bandages and sewing projects for the Red Cross, Visiting Nurses, Allen County Home and others, the Mercy Circle over the years also performed such diverse tasks as making stuffed toys for patients in the pediatric wards of local hospitals, furnishing a room at Memorial Hospital and donating beds to the hospital. “The group has made and given carpets, rags and quilts to Robin Rogers School; has given stuffed dolls to Memorial hospital; and provided Christmas cookies and candies to Robin Rogers,” the News wrote on May 26, 1963. 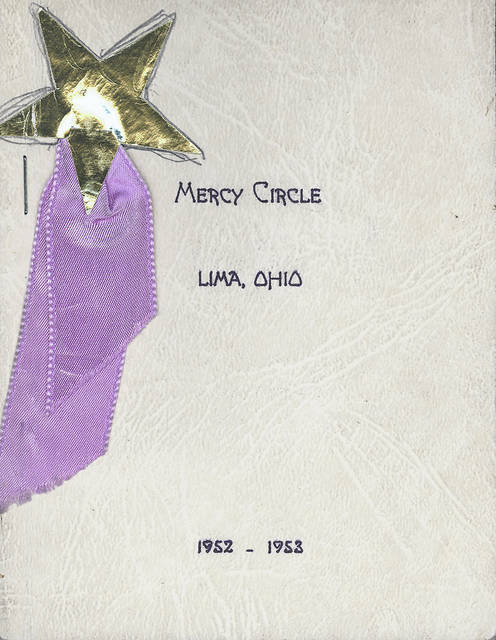 Beginning in the 1950s, instead of meeting at members’ homes, the Mercy Circle met in the Lima YWCA. The organization began its club year in October and usually completed it by June of the following year. The highlight of the Mercy Circle’s year was a Lenten Tea begun in the early 1920s.